This week's tablehopper: mighty real. A tower of power at Sadelle’s. Photo: © tablehopper.com. Howdy amigos. Spring decided to finally show its face for a couple of days here in New York. I say, “It’s about damn time, beeeeeeach! Where you been? !” Felt so good to hang out with my friend in Union Square, sitting on a bench under the trees at the end of the day on Sunday, kickin’ it after an action-packed weekend that included late-night jazz at Smalls, seeing the Sylvester Mighty Real show (was in New York one night only, until it launches on Broadway in 2017! ), late-night dinner at Le Coq Rico (some of you may have eaten at l’original in Paris! 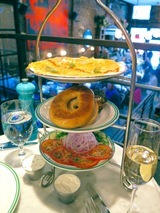 ), and a glorious late Sunday bagel brunch at Sadelle’s. Yes, there was a lot of late going on this weekend. I have another pal coming in hot on Friday, so it looks like a repeat of late-night shenanigans are imminent, reaching an apex on Sunday when we go to the Kiki & Herb show that I magically managed to get tickets for (they haven’t performed in a decade!). Now I just need to get lucky with Hamilton, I tell ya. Last night, I took a break from my deadline to call in to Slow Living Radio, who kindly invited me to be a guest for the first half. (You can listen to an archive of the show here.) Was a pleasure to talk about all the good things going on in the San Francisco cuisine scene right now, and a bit about my background and why I started tablehopper too. Thanks for having me on, Sally and Stephen! Today’s hopper is much, much bigger than I wanted it to be, so I completely failed in writing up a couple of NYC spots for you to check out. Ugh, maybe next week! The sushi counter at Sushi Hashiri. Photo via hashirisf.com. The dining room at Sushi Hashiri, showing the seasonal projections on the canopy above. Photo via hashirisf.com. Opening this Friday May 13th in the former Chez Papa Resto in Mint Plaza is ~SUSHI HASHIRI~, a high-end kaiseki and sushi restaurant. The owners—Kaoru Hayashi, Ryuichi Terayama, and Yasuyuki Rokuyata—have the original Hashiri in Daikanyama, Tokyo, and for SF, they’ve brought on executive chef Takashi Saito, the opening chef at Izakaya Yuzuki, who is fantastic. Working with him is sushi chef Tokunori Mekaru (from Hashiri Tokyo) and kaiseki chef Shinichi Aoki (he was executive chef at Menlo Park’s former Kaygetsu). The seasonally driven kaiseki menu is $250 per person for the dining room and $300 at the sushi counter. (Have we hit peak omakase pricing in this town yet?) For those who want to really be splashy, there is a $500 chef’s table menu that requires two weeks’ notice. Well then. There is a selection of high-grade sake and they carry the entire selection from Dassai Sake, plus wines and vintage Japanese whisky. There are also some special teas on offer. The pottery and porcelain is from Kyoto, and the chic room features a canopy that will bring the theme of seasons to life via 16 projectors in the restaurant (by Hiroyuki Nakano) since hashiri means the beginning stage of the season of an ingredient. (Oh, the Japanese, so wonderful.) In case you are wondering: shun is the peak of the season, and nagori is the end of the season. Scoop shares this: the room was deisgned by New York’s Yutaka Takiura and has 42 seats (there are 10 at the sushi counter). There are two seatings each night, Tue-Sat, by reservation only: 5-5:30pm and 8pm. Opening Friday May 13th. 4 Mint Plaza, off 5th St., 415-908-1919. The welcoming and colorful entrance at Fénix. Photo via Fénix’s website. A look at some of the side dishes. Photo via Fénix’s website. Like a phoenix rising from TBD’s kitchen fire, ~FÉNIX~ has opened in its place from the Mercer Restaurant Group (AQ). The new concept is a sit-down Mexican-inspired restaurant (read: not a taqueria) from chef Mark Liberman and owner Matt Semmelhack. Like we mentioned before, diners will choose some large plates to share (chicken tinga, carne asada, pescado del dia), and a bunch of smaller dishes (inspired by Korean banchan) will come out, like salsas, sikil pak pumpkin seed hummus, plates of warm and housemade tortillas, beans, rice, etc. There are also smaller dishes to nosh on (oxtail sopes, bigeye tuna coctel), perfect over a glass of sangria or cerveza at the bar—especially during happy hour (4:30pm-6pm), with $5 chicken wings, peel-and-eat shrimp, and queso fundido. Note that the restaurant is trying a 18 percent service charge model, which is added to each bill (so no need to add gratuity—unless you want to offer more, of course). 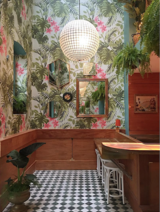 The space got a fun refresh, with turquoise chairs, lotería wallpaper, and lots of plants—it looks airy and cheerful. Open Tue-Sat 5:30pm-10pm. 1077 Mission St. at 7th St., 415-431-1826. The Popsons cheeseburger. Photo: Michael David Rose Photography. Exterior of Popsons. Photo: Tory Putnam. There are many, many fans of the insanely good cheeseburger at ~CAUSWELLS~, which led to owner Alvin Garcia and chef-partner Adam Rosenblum’s pop-up, Burger SF, at Cease & Desist in the Mission, and currently in the original Marlowe location. And now their permanent brick-and-mortar location and burger concept is officially open on Monday May 16th in Mid-Market: ~POPSONS~, which we told you about. It’s in the Warfield Theatre building. The menu includes their trademark cheeseburger; a chili cheeseburger; a savory burger with mushrooms, truffle cheese, caramelized onion, lettuce, and aioli; their Mission Dog (quarter-pound all-beef dog, bacon, grilled onions, jalapeños, mayo); fries (naked, seasoned, chili cheese); and shakes (vanilla, chocolate, seasonal fruit). They also have a new Popsons beet and quinoa burger with truffle cheese, aioli, pickles, onion, and sprouts. The burgers are made with Five Dot Ranch (beef is ground fresh daily), and they also work with Schwarz Sausages (dogs), Petit Pains (their custom buns), and local creamery Double Rainbow Ice Cream. The light and airy 1,300-square-foot space (designed by Arcsine, in partnership with UpCycle Builders) has room for 87 diners. There’s an open kitchen, exposed concrete walls, high ceilings, and a hand-painted mural by local artist Ian Johnson. There’s also an outdoor patio. Soft opening hours are tomorrow (Wed the 10th), starting at 12pm with 100 classic burgers and fries until sold out, and the same thing on Thu and Fri. They’ll be closed over the weekend and open officially Monday. Hours are Mon-Fri 11am-8pm to start, and weekends soon. 998 Market St. at Taylor, 415-658-7554. The cheerful interior of Orson’s Belly. Photo courtesy of Cem Salur. Another look at Orson’s Belly. Photo courtesy of Cem Salur. Welcome to Orson’s Belly! Photo courtesy of Cem Salur. Almost exactly a year ago, we mentioned a new café that would open in the Outer Richmond called ~ORSON’S BELLY~. Cinephile Cem Salur hoped to open last year in time for Outside Lands, and thanks to the insane levels of bureaucracy one has to navigate to open a business in San Francisco, he’ll be open in time for this year’s Outside Lands instead. In fact, he’ll be open on Monday May 23rd. To recap, the 50-seat café will be open in the morning at 8am for breakfast and coffee service from De La Paz. The menu has some appetizing picks, from Turkish breakfast (the owner is Turkish) to a superfood waffle with honey peanut butter, strawberry, almonds, and chia seeds. Lunchtime brings bagel sandwiches to some awesome salads (the menu is mostly vegetarian, and very fresh), like a veggie Cobb with romaine, avocado, hard-boiled eggs, feta, roasted chickpeas, and Worcestershire dressing. Starting at 4pm, there will be a meze platter, tacos, and bar bites to go with the beers and wines, many from California. Coffee drinks will range from espresso to pour-over to Turkish coffee. There will be themed nights including poetry, programmed cinema (programmed by Salur), lectures on writing and cinema, children’s happy hour, and much more. The room looks great, with original film posters and lots of wood, and brightly colored Tolix chairs and groovy light fixtures. Hours will be Mon-Thu 8am-8pm, Fri-Sat 8am-10am, and Sun 11am-6pm. Follow along on Facebook for updates. 1737 Balboa St. at 19th Ave. The interior at Red Dog. Photo via Facebook. Custom floral wallpaper at Leo’s. Photo via Leo’s Instagram. And…it’s back. Woof! 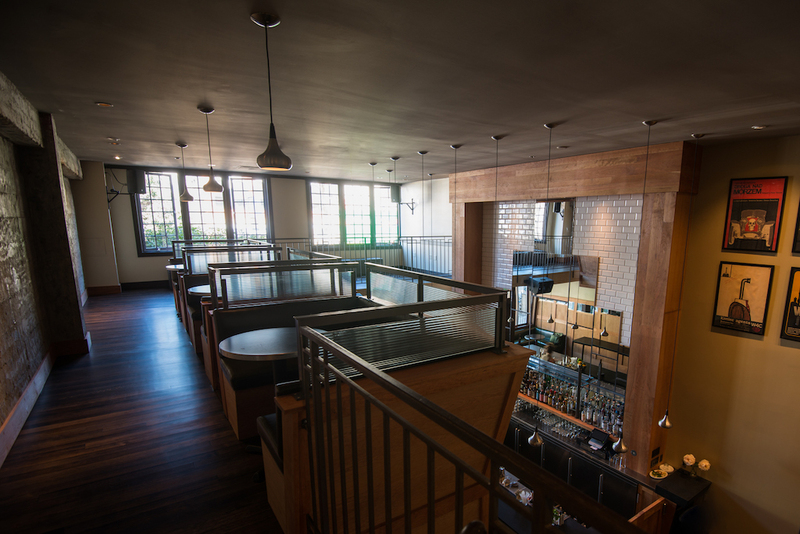 Lauren Kiino of SoMa’s ~RED DOG~ has reopened the restaurant after a temporary closure. The ownership team is now partnering with the group behind Oola and Local Kitchen & Wine Merchant—things will remain the same at Red Dog, though now they’ll have more sales and marketing support. And the city’s best egg salad sandwich is back in our lives, praise the lard. Open Mon-Fri 11:30am-10pm, Sat 10am-10pm, Sun 10am-3pm. 303 2nd St. at Folsom, 415-692-0211. ~LEO’S OYSTER BAR~ just launched lunch service Mon-Fri, offering selections from the raw bar, seafood, small plates, soups and salads (bring on the Louie! ), sandwiches, large plates, and Champagne and cocktails if you feel like having that kind of lunch. Mon-Fri 11am-2:30pm. 568 Sacramento St. at Montgomery, 415-872-9982. According to ABC license transfer activiity, the folks behind Andalé (you know, the place you get a breakfast burrito before hopping on a plane at SFO) look like they are taking over the former Reverb/Verbena space on Polk. We’ll let you know when we hear back with info about their plans. 2323 Polk St. at Green. A friend let us know that things were kaput with ~KIT FOX~ at The Hall, and Deborah Blum’s upcoming mega ~CITIZEN FOX~ project that was coming to Mission Street. So, no beer and brewpub from Rich Higgins, no vegan menu, no bar, no coffee, and no vegan Frozen Kuhsterd either. Reasons? We reported that chef Kevin Schuder had departed, and Eater reports construction has been a bear. (No news there.) 2205 Mission St. at 18th St. The patio at Starbelly. Courtesy of Starbelly. There has been word of a project brewing in the Castro called ~FINN TOWN~, and now it has been revealed the project is from Ryan Scott and business partner Rick Hamer, who will be opening the “tavern with a twist” in early fall. There will be two full bars with two cocktail lists (from Fifty Fifty Cocktail Co.), dinner served late (all entrées will be $25 and under), and brunch. Sample dishes include Gruyère popovers, crab tater tots, and sweet tea-brined fried chicken. Jim Maxwell of Architects II is designing the space, which was previously the rotating door of Barracuda Sushi, Mandu Noodle House, and Jänchi Korean Gastropub. 2251 Market St. at Sanchez. Weekday brunch, it’s a good thing, and ~STARBELLY~ will now be serving it Mon-Fri 11:30am-4pm. French toast, fried chicken, market scramble, pizza, Pimm’s Cups, and free WiFi. 3583 16th St. at Market, 415-252-7500. Twiglight at the Presidio. Photo from Facebook. Consider this a quick-fire round of cool events and happenings. If something catches your eye, be sure to click through for more details. Tonight (May 10th) at 5pm PST, La Cocina’s amazing auction is ending. You won’t believe the dinners and experiences you can bid on, like Melissa Perello cooking dinner at your house, dinner at the Tartine Manufactory, and an all-expenses-paid trip to New Orleans, with dinner at Shaya. Check it all out! Pasta lovers, ~FLOUR + WATER~ is turning seven, and they’re running a pasta tasting menu to celebrate from now through May 14th (seven courses, $70). Plus a special off-the-menu late-night dish will be available every night starting at 9:30pm; check their Instagram each day to see what it is. Fellow fans of chef Sean Baker’s (formerly Verbena) food who miss his cooking should jump on a special Feastly dinner he’s hosting with his wife, Renee Baker, on Saturday May 21st. It’s called An Evening at Békǝr and is $135. The menu looks incredible, don’t miss it. Presidio Twilight returns on Thursday May 12th, from Off the Grid and the Presidio Trust. In its fourth year, you can enjoy street food, cabanas, fire pits, live music, and cocktails. Bonus: Lyft will take 20 percent off rides to and from the Presidio when using Off the Grid’s designated ride-share zone. Every Thursday through October 6th, 5pm-9pm. Also on Thursday May 12th is the annual fundraising event, Taste of Potrero, in support of Daniel Webster Elementary School in Potrero Hill. The list of participating restaurants is pretty rad, check it out. 7pm-11pm, general admission ($125); VIP admission ($225) has a 6pm entrance. Pier 70. Do the math: Eric Ripert plus his new book (32 Yolks: From My Mother’s Kitchen to Working the Line) at ~BAR AGRICOLE~ on Monday May 23rd from 7pm-9pm. Snacks, drinks, done! Tickets: $75 (does not include a copy of the book). The future entrance to Pacific Standard. Rendering courtesy of Half Moon Bay Brewing Company. Scott Brennan of The Fifth Quarter Charcuterie is opening his own shop. Photo courtesy of Scott Brennan. Good news for cheese fanatics (i.e. most of us): SF’s Mission Cheese was originally going to be opening a second project ~MAKER’S COMMON~ in SF, but now it’s going to be on University in Berkeley. It’s going to be a larger project, with a sit-down restaurant and retail market. Nosh reports founders Sarah Dvorak, Oliver Dameron, and Eric Miller are still raising money for the project in case you want to get involved. 1958 University Ave. at Bonita, Berkeley. This summer, craft brewer Half Moon Bay Brewing Company will be opening ~PACIFIC STANDARD~ in downtown Berkeley, a taproom and bottle shop. There will be 15 to 20 local and regional beers on tap, with up to 50 percent of the beer sourced from the on-site brewery at Half Moon Bay Brewing Company. 2055 Center St. at Shattuck, Berkeley. Olive oil lovers know ~THE PASTA SHOP~ is one of the best places to buy and learn about olive oil, and on Saturday May 14th is their Extra-Virgin Olive Oil Festival 2016 at the Berkeley store. Taste EVOOs from California, Italy, and Spain and talk with the experts while enjoying the ice cream and olive oil sundae bar. Ten percent off all bottles of olive oil, score. 1pm-3pm. 1786 4th St. at Delaware, Berkeley, 510-250-6004. Great news: Scott Brennan, formerly from Cafe Rouge—who has been making charcuterie on his own for the past five years and selling at farmers’ markets in Berkeley on the weekends—will be opening a retail storefront of his business, ~THE FIFTH QUARTER CHARCUTERIE~, in Montclair Village in Oakland. He is gunning to open sometime in July in the former Amba Falafel space. Besides having a meat counter for his wide selection of sausages, pâtés, cuts of meat, and prepared foods, he will also be offering sandwiches and expanding into dry-cured meats. Bring on the boudin blanc, duck rillettes, and stuffed quail. 6464 Moraga Ave. at La Salle, Oakland. We read on Chowhound that ~PHILOMENA PIZZA~ has opened in East Oakland from the owners of Portal, serving thin-crust pizza and microbrews. Open Mon-Fri 11am-10pm, Sat-Sun brunch 10a-3pm and dinner 3:30pm-10pm. 1801 14th Ave. at E. 18th St., Oakland, 510-532-2399. And a quick update on the former Bay Wolf location: Scoop reports Rich Wood (Wood Tavern, Southie) will be calling it ~THE WOLF~. There will be a bar, the kitchen is expanding (and will have a 12-seat dining counter), and the patio will remain! Look for a possible opening in November. 3853 Piedmont Ave., Oakland. Opening on Sunday May 15th will be the CUESA-operated farmers’ market at the Jack London Square Farmers Market—they are taking over for Pacific Coast Farmers’ Market Association, which has run the market since 1989 (many of the same vendors will still be there). You can read more in this FAQ, but the hours are Sundays 9am-2pm, year-round, rain or shine. Jack London Square, 387 Water St., Oakland. A look at Laszlo’s new bar. Photo: Charlie Villyard. The bar looks so airy and spacious! Photo: Charlie Villyard. Back in December, I let you know that ~LASZLO~ was getting an update after 15 years, moving away from its industrial and dark look. You ready to see this gorgeous new bar? It reopens on Thursday May 12th. Foreign Cinema’s Gayle Pirie and John Clark used the same company that worked on Laszlo’s original build-out, Praxis Architects. The space has a much lighter and airy look, with new seating throughout, lighting, a new DJ platform, upgraded sound system, and seasonally driven cocktail menu by Foreign Cinema and Laszlo bar manager Nicky Beyries. Don’t forget the hidden-away tables on the mezzanine too! You can still order food and brunch in the bar, plus there’s a new bar bites menu that includes FC’s superlative Madras fried chicken as a sandwich, whut? Open Mon-Wed 5pm-12am, Thu 5:30pm-2am, Fri 3pm-2am, Sat 11am-2am, Sun 11am-12am. 2526 Mission St. at 21st St., 415-401-0810. A tablehopper reader let us know the one-and-only ~Gwyneth Paltrow~ was at Tacos Cala on Cinco de Mayo (to quote her oft-used hashtag, it’s a #Gspotting)! She is in town for her fab goop pop-up shop (through May 22nd) at the former Xanadu Gallery on Maiden Lane (designed by Frank Lloyd Wright!) and to promote her new book, It’s All Easy. All content © 2016 tablehopper, LLC. I am more than happy if you want to link to my reviews and content elsewhere (thanks, glad you dig it), but republishing any part of them in any way, shape or form is strictly prohibited until we talk first. Please take a look at my Creative Commons license for more detail.